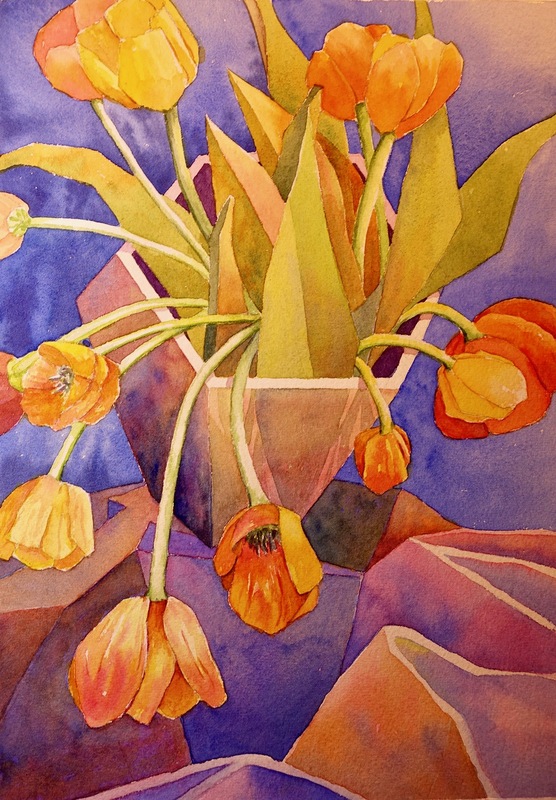 Spring Saturday and Tuesday Watercolour Class – Week One! 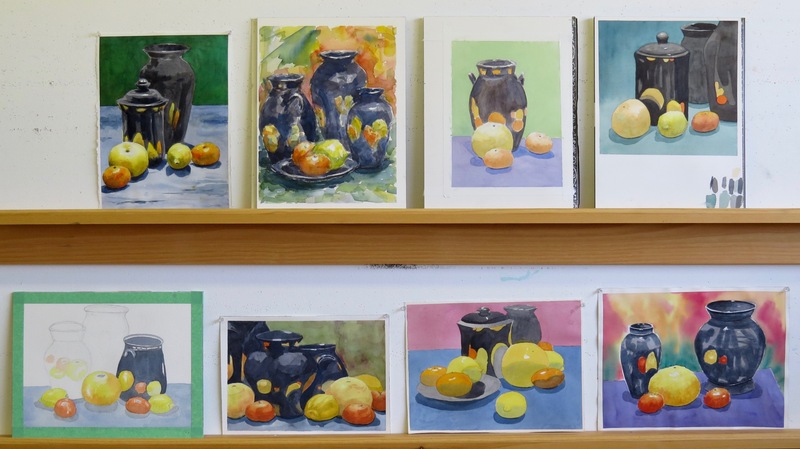 It was a classic still-life for the Saturday and Tuesday watercolour painters this past week. I thought that our apples and terra-cotta objects would be a refreshing subject after the layoff of a month or so since the end of the winter classes. My demonstration was a small painting, done quickly. I started with a wet-in-wet preliminary wash of warm colours over the whole sheet. You can see the wash in the background, untouched. As usual, I talked as I painted. My demonstrations are usually a sort of illustrated talk; a way of showing a process and discussing painting problems. I don’t mind quick and messy if I can communicate my ideas. The Saturday students used their six hour day well. Most take their time with compositional sketches and studies of the various objects before embarking on their sustained piece. Some complete more than one piece over the course of the day. I love the thought they put into their work! Also of note are the pen and ink drawings that hold their own with the watercolours on our critique wall. We work from the same still-life on Tuesday. 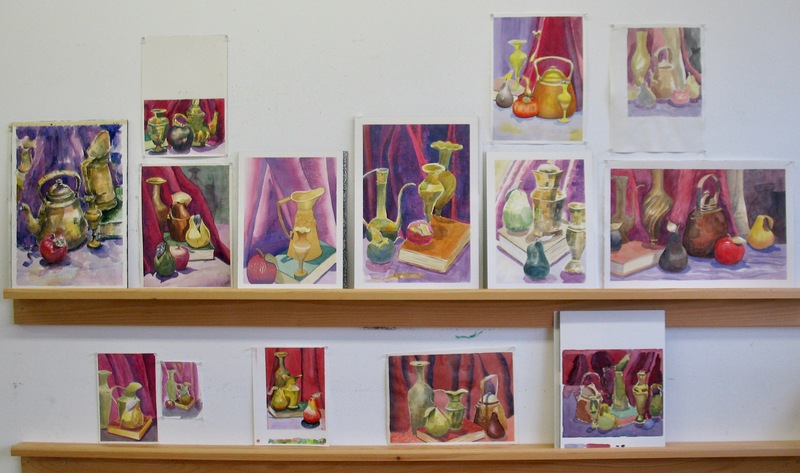 Here’s a look at the still-life with a backdrop of a different colour. 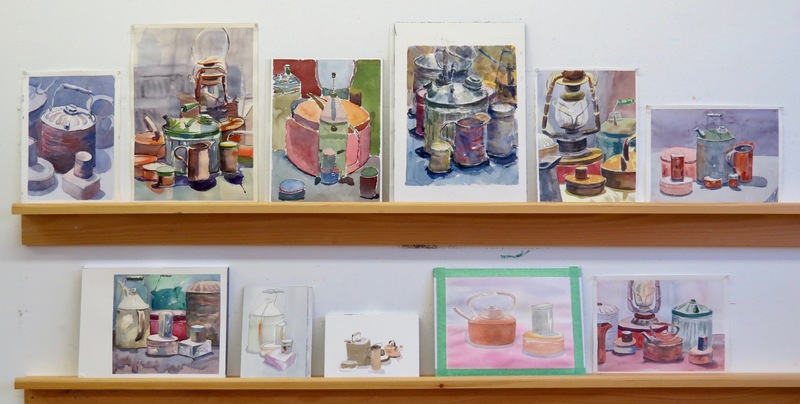 In the Arts on Adrian studio, the still-life is placed in the centre of the room with an overhead light. There is no backdrop so the students have to come up with a creative solution of their own. However, I photograph the still-life with backdrops of different colours in order to try different relationships and to make the still-life stand out clearly for these blog posts. There you go! Let’s see what the Tuesday afternoon and evening painters achieved. I’m back at Arts on Adrian on Saturday, April 21 and Tuesday, April 24. There are still a few spots left! Care to join us? Reminder: Click on any critique image for a larger version. Winter Saturday and Tuesday Watercolour Classes – Week Three! Black objects and reflections! How would the students at Arts on Adrian respond to this painting challenge? Let’s find out. My demonstrations on Saturday and Tuesday focused on two main things. First, how to paint black without any black paint in the palette? There are a few ways to mix blacks. Ultramarine Blue works well with Burnt Sienna. An unusual way to make black is to mix Viridian or Pthalo Green with a cool red. My cool red is Rose Madder Quinacridone from Da Vinci. I settled on Cobalt Blue and Burnt Sienna. The second thing was reflections. I discussed a few guidelines about handling reflections. Most of the reflections in our still-life could be painted with crisp edges. Success is based on accurate value relationships between the actual objects being reflected (grapefruit, orange, lemon) and their reflections on the surfaces of the black vases and jars. The Sustained Saturday students approached the reflections with gusto! My Tuesday demonstrations dealt with the same ideas. In the evening, I took a study a little further and added a background. The Tuesday afternoon and evening students were equally enthusiastic. The black objects and reflections were a tricky painting problem but everyone enjoyed the process and learned a lot. That’s it for our winter term at Arts on Adrian in Toronto. I’ll be posting my spring calendar very soon. Thanks for following! 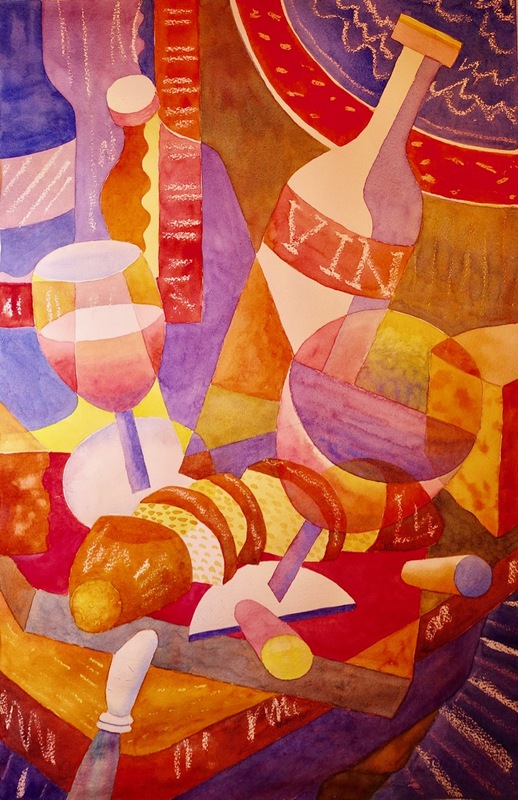 Create a ‘Cubist’ Watercolour – Followup! 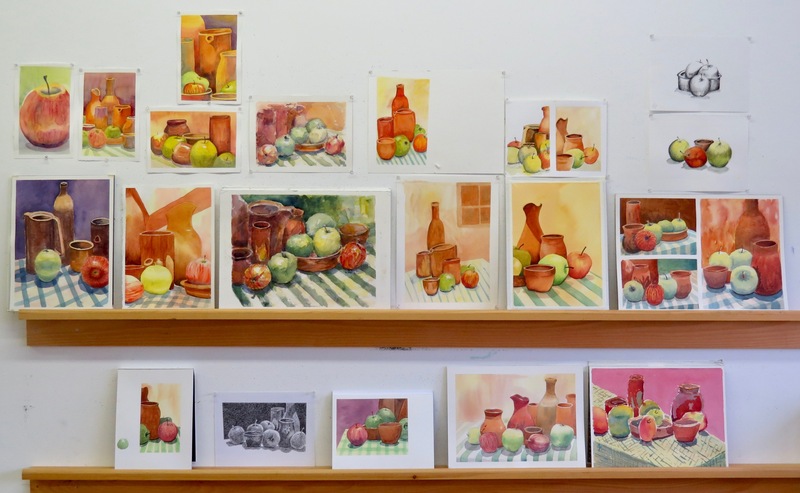 Last November, I taught a two-day watercolour workshop at the Dundas Valley School of Art. 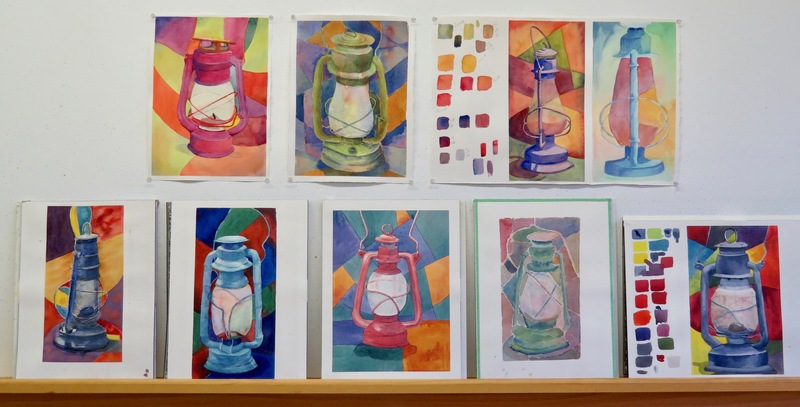 The title of the workshop was Create a ‘Cubist’ Watercolour. Click here if you’d like to review the post about the workshop. It was essentially a creative exercise inspired by ideas from Cubist artists, particularly Pablo Picasso, Georges Braque and Juan Gris. Other modernist artists such as Henri Matisse were discussed. 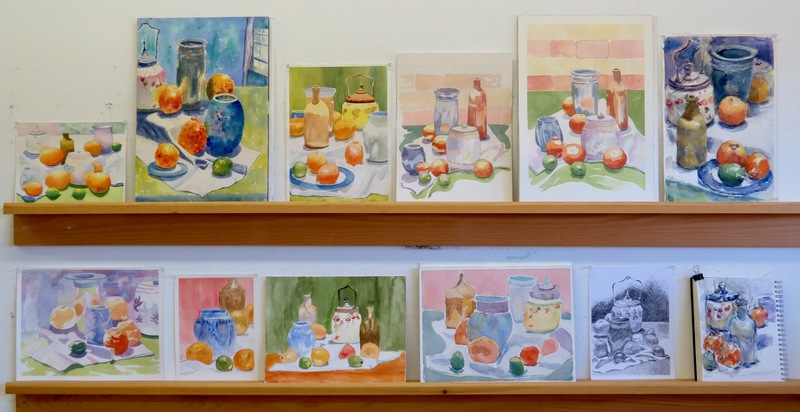 The watercolour studies and paintings were developed with a very traditional step-by-step approach. Colour and composition were carefully considered. Textures were created with the use of resist materials and watercolour techniques. The results were anything but traditional. However, the paintings were colourful, playful and expressive. Where does a student go with these new ideas following the intense two days of the workshop? I’m not always able to follow up. This time, however, I was able to do so. Two of the participants, Evelyn Cunningham and Rosemary Tannock, are involved with the Arts on Adrian studio in Toronto. Evelyn is a founding member and Rosemary is a regular participant in classes and open still-life sessions. I see them both fairly frequently and they see each other a lot, as well. 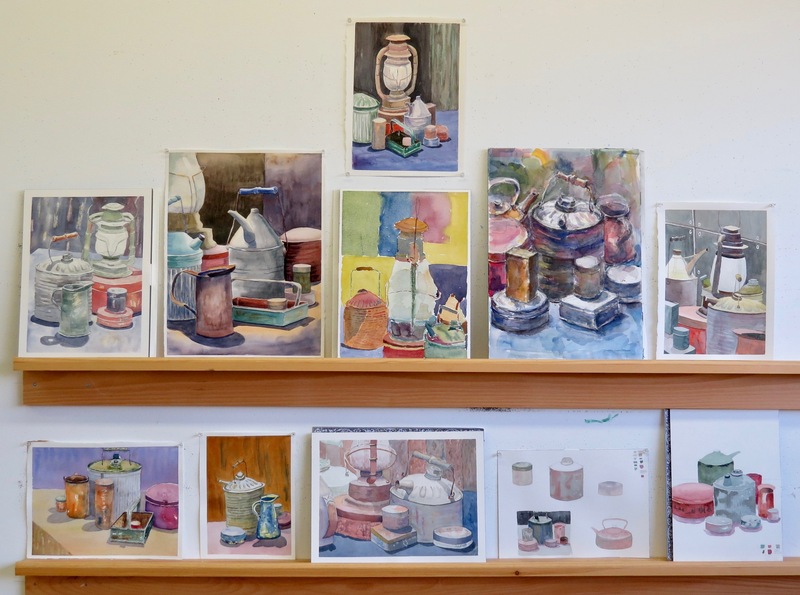 Allow me to introduce them by way of their finished watercolours from the DVSA workshop. Apparently, I’d created a monster! Two monsters. Evelyn and Rosemary were very excited about the workshop and continued to apply their new concepts in the studio. They shared ideas and feedback with each other and sent images of their new work to me. Reports came in from their other drawing and painting friends. The two new ‘Cubists’ were telling everyone about the experience. I decided to make the most of their enthusiasm and proposed this followup post. Evelyn and Rosemary have agreed to share their work and thoughts with you. Why did you sign up for the workshop? To do something completely different, after a positive experience of using my left (non-dominant) hand. Also I was interested in what attracted Barry to this way of thinking. ***Note: Evelyn suffered a nasty injury to her right hand last year which has since healed. For several months, including two weeks with my watercolour painting holiday in Portugal, she worked exclusively with her left hand. 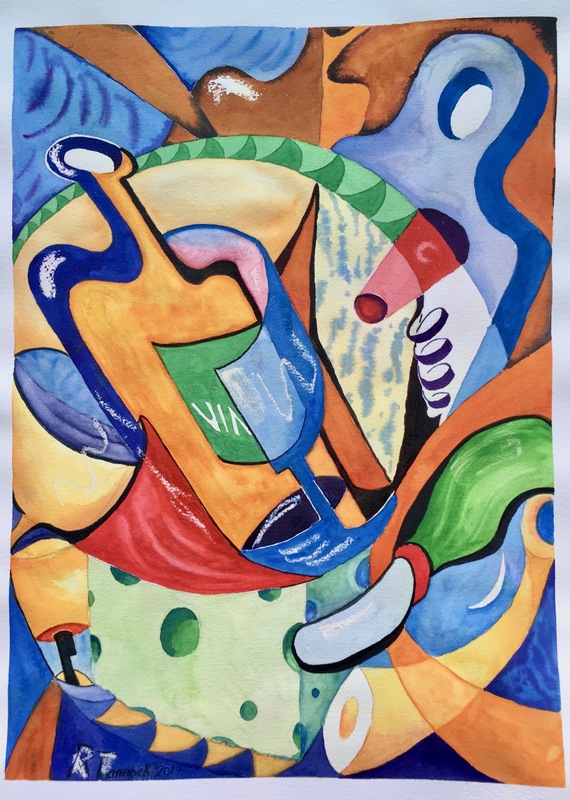 1) I had seen your creative and colourful watercolour cubist compositions on your blog; these captured my interest initially because of the colour combinations and whimsical form​s, but had no idea how you created them​. 2) I had limited knowledge of Cubism and previously have bypassed them in exhibitions because I did not know how to approach them. How has the workshop influenced your work since? To my great surprise, I found breaking the conventional rules about perspective, colour and realism to be both scary and exhilarating. As a result of this workshop, my pendulum has moved back from doing the purely “Cubist” approach that Barry showed us, to trying to combine my natural painting instincts from before with giving myself permission to do the exact opposite of previous habits, in the same painting. It has resulted in some uncertainly, but a lot more fun. 1) Your introduction to Cubism was so informative and interesting: it allowed me to better understand its philosophy, approach and its forms. 2) During the workshop exercises and activities, I realized how engaging Cubism is: from initial idea, design of thematic forms, through to colour choices and whimsicalness. 3) It is the first workshop I have ever taken that has stimulated me – drove me eagerly – to pursue and explore a specific approach independently: this approach to Cubism is artistically, technically, and intellectually engaging and challenging, while being great fun! The new paintings since the workshop! 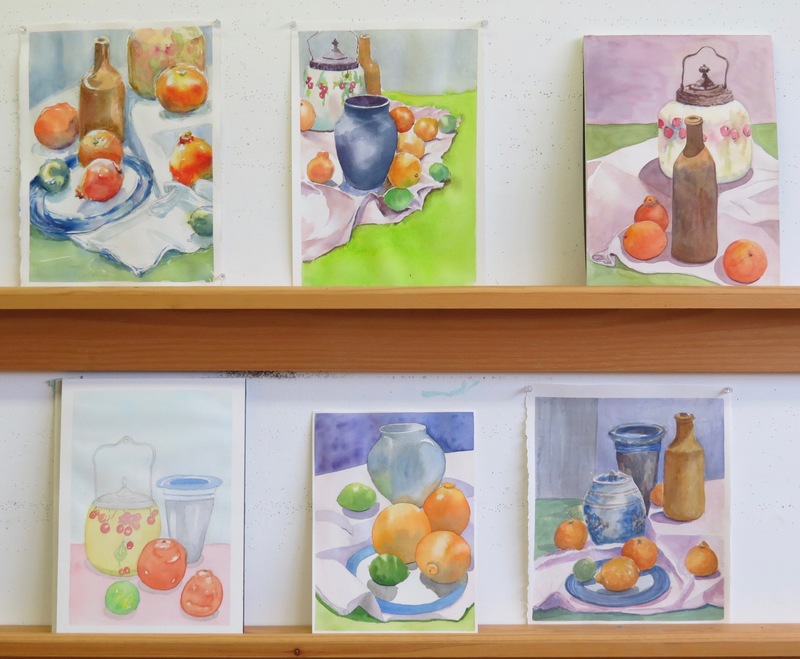 Now, let’s have a look at six watercolour paintings completed by Evelyn and Rosemary since the workshop. Click on any image to see a larger version. TULIPS and TULIPA were painted during an Out of Control Tuesday watercolour session at the Arts on Adrian studio in Toronto. These sessions allow the painters to work and interact without instruction. 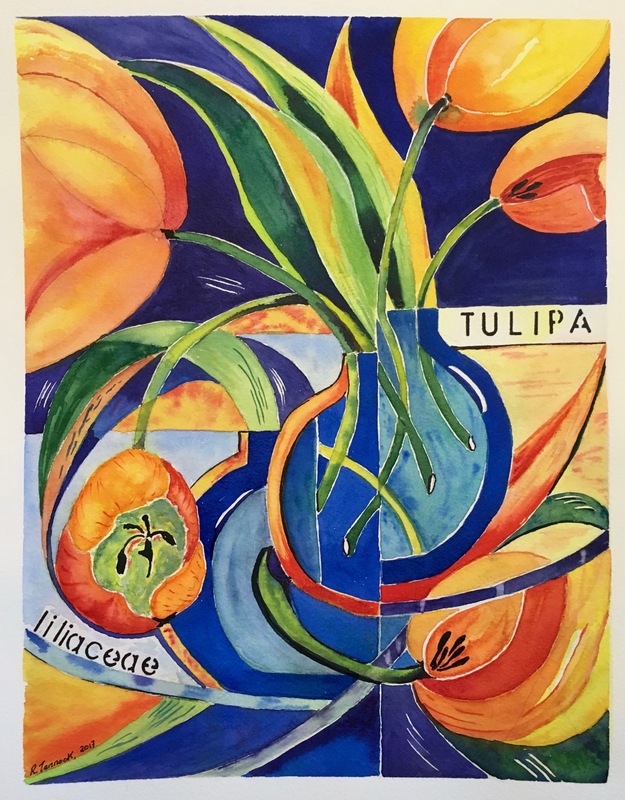 In TULIPS, Evelyn has utilized a planar approach and distorted the perspective of the vase. The attractive cool/warm colour system softens the angularity of the forms. Rosemary has flattened out the shapes in TULIPA and intensified the colours. Her use of the written word enhances the flatness of the painting’s surface. TOYS is as playful as it’s subject matter suggests. Another planar treatment is combined with a geometric background. The warm colours evoke pleasant associations with play and youth. 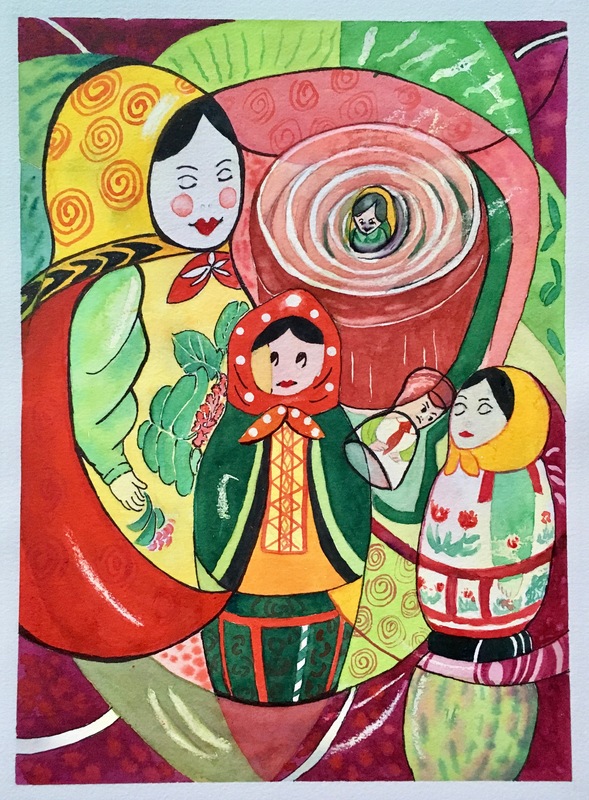 In MATRYOSHKA DOLLS, the flatness is further emphasized by the black lines. Texture and pattern add interest to the shapes surrounding the dolls. 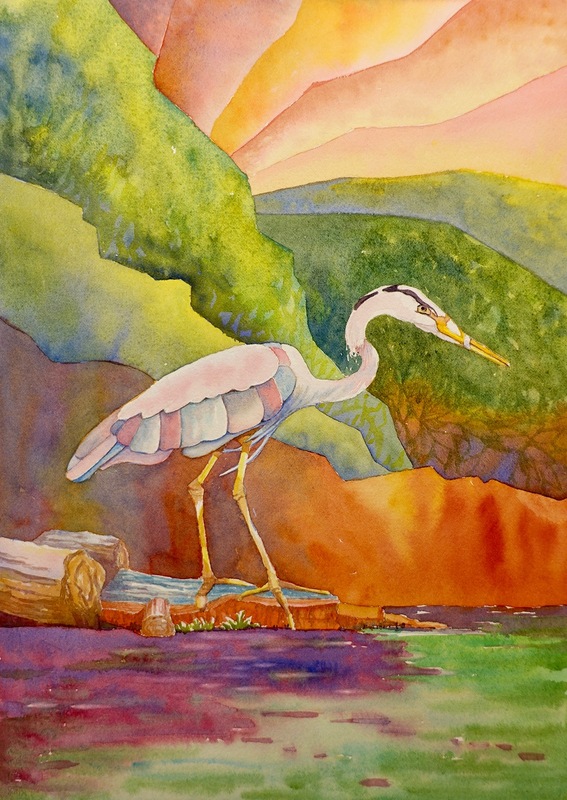 Evelyn uses soft, wet-in-wet washes to create a tranquil quality in GREAT BLUE HERON; a real celebration of unspoiled nature. Almost everything has been simplified into basic shapes and planes. Only the water and, perhaps, the logs are treated in a more traditional and naturalistic manner. 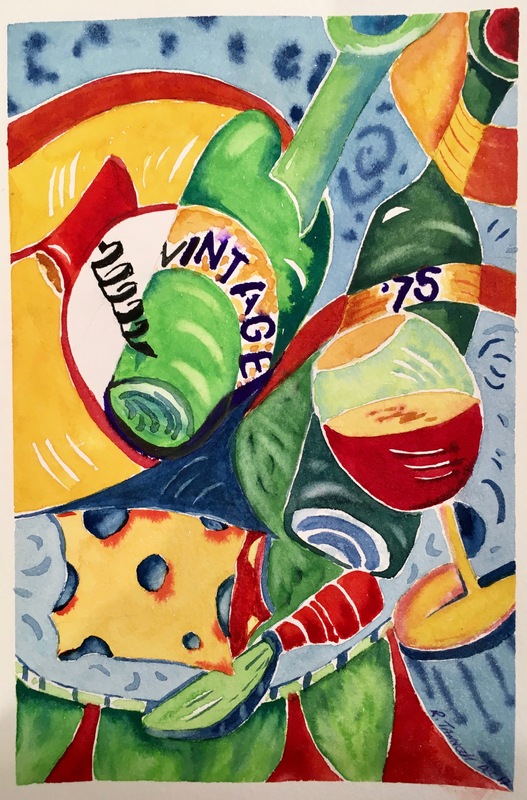 Rosemary re-visits the wine and cheese theme in VINTAGE 75. This was painted as a birthday card for a lucky friend. The curves and diagonals combine with complementary colours and the dynamic result embodies the fun of a great birthday party. Evelyn and Rosemary continue to work with ideas from the workshop! Their creative courage and spirit of adventure has impressed me and their painting pals. At times, most of us have been stuck in the painting doldrums, lacking inspiration and wondering how to deal with it. 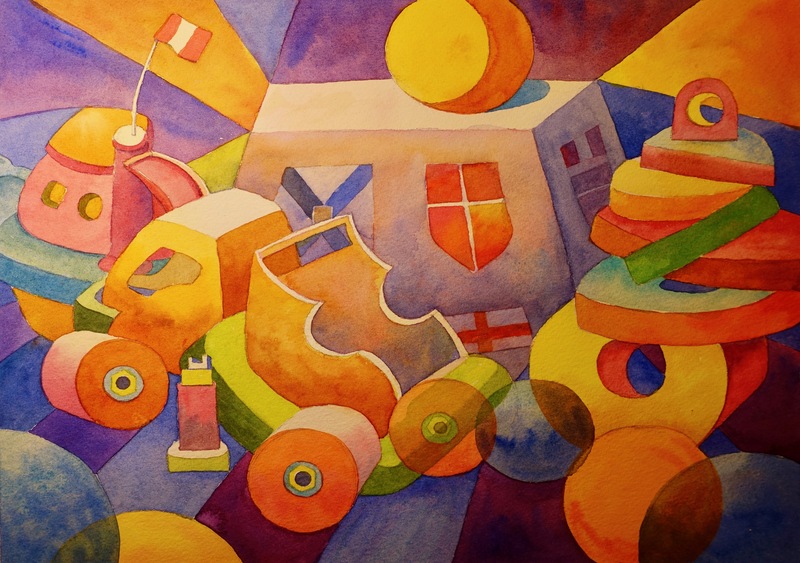 A creative exercise such as our Cubist watercolour workshop can be refreshing and liberating. We may never thoroughly embrace every new idea but good things can seep into and re-invigorate our work. Thanks, Evelyn and Rosemary! How about some comments? I know they’d like to hear from you. Winter Saturday and Tuesday Watercolour Classes – Brass! 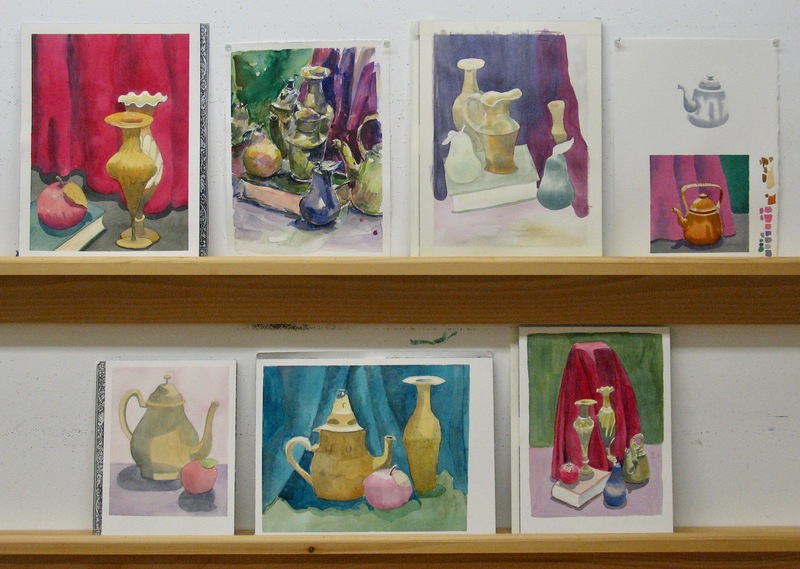 Here are two views of our still-life from the Saturday and Tuesday watercolour classes at Arts on Adrian in Toronto. Saturday class is an all day affair and I suggested that the students take the time to do a small warmup painting. I used a flat angled brush for my demonstration and worked very quickly. 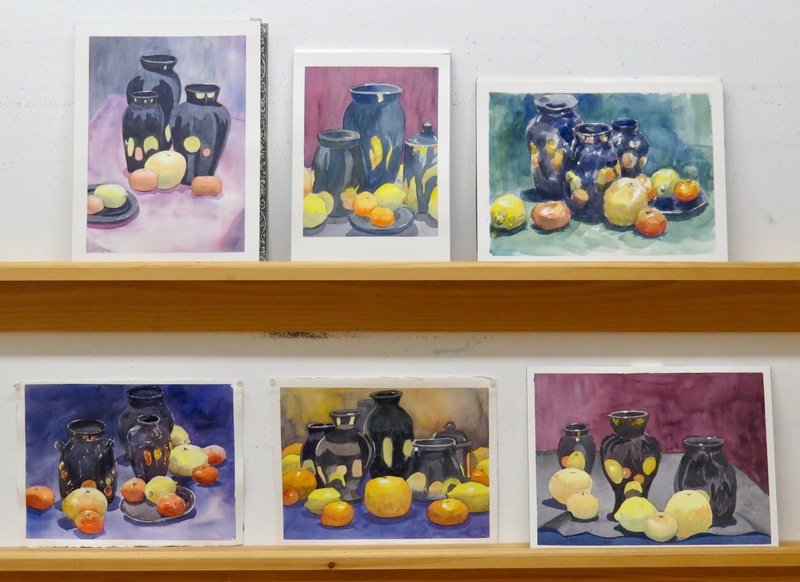 As I painted, I discussed various aspects of the still-life. Fast and messy, this painting is not an end in itself but part of a process. A warmup painting can help the student identify potential problems and challenges before tackling a sustained piece. Several of the students followed my lead before settling into a more sustained painting. Tuesday classes are three hours in duration. I decided to discuss the drapery behind the objects. My demonstrations simplify the folds as much as possible. That’s it for Winter term at Arts on Adrian. I’ll be posting my Spring calendar soon! Winter Saturday and Tuesday Watercolour Classes – Rust and Dust! 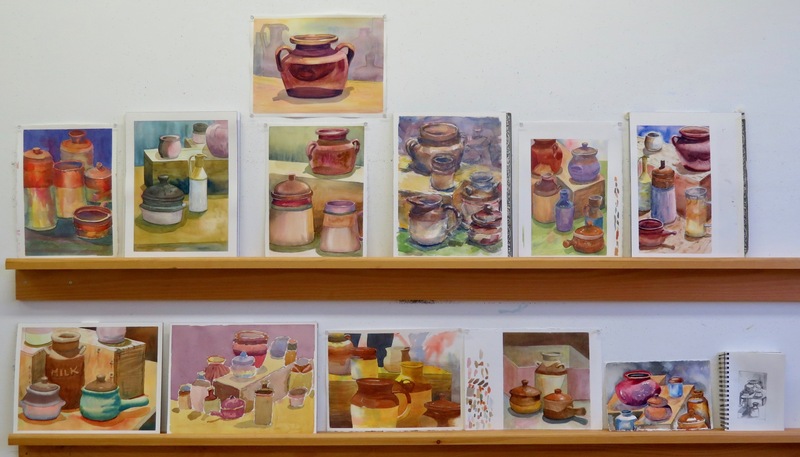 These old cans and containers have a lot of character and are always a popular subject with the watercolour students. On Saturday, I focused my demonstration primarily on colour and texture. 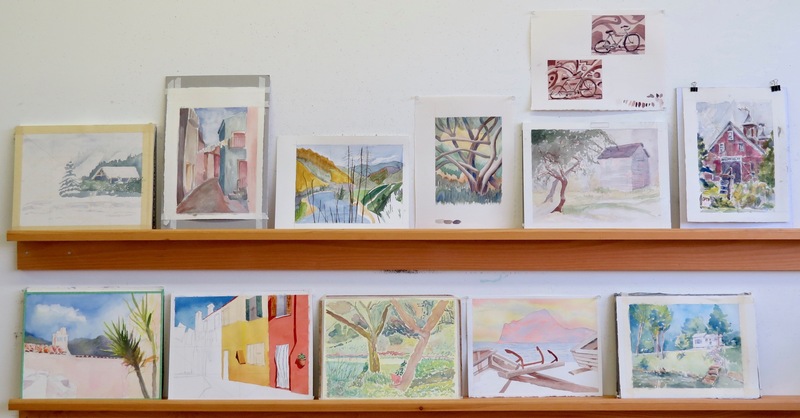 A Sustained Saturday class is six hours long and it allows the students lots of time to complete thumbnail sketches and small studies before starting a more ambitious piece. This extra effort always pays off! Tuesday was quite a challenge and I’m not talking about the watercolour painting! Our region experienced an ice storm. I followed the weather report every half hour and decided to run the classes. Amazingly, eleven determined students showed up for the afternoon class. Unfortunately, conditions worsened but four undaunted (maybe crazy) artists turned up for the evening session. I concentrated on simplification and colour with my demonstration. The small study on the right was done in the evening. I’ve drawn attention to the foregound object by eliminating all paper white in the background with a cool grey wash. When that wash dried, I added shadow shapes of the other objects in a single value. Suggestion versus depiction. A potentially disastrous day turned into a success!